Some times the unexpected happens. Actually when hunting, you can almost guarantee that things won't go as planned! When I filled my first tag on Wednesday morning, I had no expectations of filling a second tag. I knew I would only hunt one or maybe two more times before our week of hunting Kansas was over. I'd let Troy hunt the remainder of the time so he could fill a tag. I was happy to just get one and was planning on playing at the pool, sleeping in and exploring the town parks with our almost 2 year old daughter. So when the weather didn't look optimal on Thursday evening, I volunteered to take that hunting slot and let Troy have the following morning hunt. The wind was HOWLING and at times my blind threatened to lift off the ground and take to the sky. Luckily the huge trees along the creek acted as a wind break and took the brunt of the forceful wind gusts. Not sure if the turkeys would even hear any calls, I thought, "well at least I can practice my calling." I made several LOUD calls on my box call, hoping that if anything was close it would catch their attention. After about an hour of the wind fest, things calmed down and I began to wonder if I actually had a chance of catching a turkey heading to their roost. I reached for my Colorado custom glass call and began to make some sweet hen calls. After a short time, I wondered if anything was down below across the creek, curiosity got the best of me as I peeked through the small slit in the back of my blind. Another round of hen calls were made and the feeling you get when someone is staring at you washed over me. I turned my head and caught two red heads just beyond a small pine tree. I ALMOST got busted but froze and hoped for the best. Legs in the squatting position began to burn as I did my best to S L O W L Y turn my body around and sit down in my blind. Now out of sight of the eyeballs piercing through the grass, I reached for my gun and sat motionless, hoping the toms would make their way up the hill to my decoys. Finally, I could see them making their way across the top of the hill, but not trusting my naked eye, I made a clumsy effort to look through binoculars to check for beards through the grass. Yep! The one leading the group was a tom! They were now about 50 yards out and making a bee line towards the roost tree, skirting my decoys and in a matter of seconds would be out of range. As the lead tom crested the top of the hill, it was now or never! I took aim and thought, "it's going to be either miss or kill on this one!" BOOM! I dumped him and sat in shock at what just happened. After gathering my wits and realizing I just filled both of my tags, I smiled and sent my husband a quick text that simply said, "I'm done." I hunted a grand total of two times that week... a morning hunt and an evening hunt and ended up with a turkey on each hunt. I'm still kind of shocked about it because that NEVER happens for me. We laughed later because Troy was right in the middle of changing an extremely dirty diaper when I texted him that night. He kinda got the short end of the stick. That wasn't the plan. Roost tree to the right, blind in the middle, picture taken from where turkey took a dirt nap. The soft red beam from a headlamp clicks off, replaced now only by faint moonlight, I slow my steps until my eyes adjust to the darkness. Quiet blankets the earth in the pre-dawn hours. The sound of footsteps cutting through the prairie grass are carried off behind me as a gentle breeze kisses my face. A modest cut in the prairie snakes its way down toward the lower ditch lined with tall cottonwoods, paralleling a stream, marking my destination. Nestled against a small pine, a dark form is now barely visible in the blackness. Climbing into my blind, the silence is disturbed only by a slow and steady unzipping of the windows, cutting the darkness, revealing only a glimmer of moonlight into the pitch black hideout. I have enough light to pull decoys out and get everything situated, as I prop my 20 gauge beretta against the wall of the blind, a quick check with the red headlight beam is done which reveals no spiders, snakes or other intruders in my home for the morning. A girl hunting solo is now confident, comfortable and ready for the world to wake up around her. Midway into the hour before sun-up, an owl swoops down landing on a branch visible from my blind window and makes his presence known. The sound that answers his soft "Hoo..h'HOO-hoo-hoo" would make even a non-turkey hunter's heart explode with excitement and wonder. The tree towering above the blind, not even 50 yards away, erupts with gobbles. I can now hardly contain my excitement, waiting on shooting light, listening to turkeys gobble from the limb right above me. I sit listening to the gobbles, just taking it all in. Another owl in the not so far distance joins in the fun, prompting even more gobbles from the towering trees above me. Holding my new Colorado custom glass call, I recall a conversation prior to our hunting trip. It was mentioned that I would have a tough time hunting by myself this trip since I wasn't as good a caller as others. Words that were absorbed, not denied but not taken to heart either. I was just happy to have the opportunity to hunt, regardless if it I had to do it solo. Honestly, I was up for the challenge! Listening closely to what was happening in the trees above me, I wait for the first hen to wake up. At the sound of the first cluck, I try my best to match her call. A few more strikes on the call and the Toms know there is a "hen" up by me. The waiting game begins. There is no mistaking the sound of turkeys flying down from their roosts. The first one pitches down into the field on the other side of the creek bed, as branches unburden their load, and flapping of wings reveal the next round of the game is about to begin. One, two, three, four, and I begin loosing count as the sequence continues. Then silence. It doesn't take long to spot them. Peeking through the slit in the back window of my blind, I can now see several toms fanned up, showing off for the ladies. Letting out a few calls, I try my best to convince them to cross back over the creek and compete for the hen decoy in front of my strutting jake. No luck. Apparently my calling wasn't too bad though because shortly after the toms made their way up the creek bed, I heard another gobble coming my way. Another quick check through the back window and three turkeys were coming in FAST! I had enough time to pull up my binoculars, determine they were jakes and make the decision that I would still fill a tag if presented with a shot. With my gun at the ready, I made one last call and sat down with my back to the creek, watching my decoys on the hill, straining to listen for their next move. A distinct flap of turkey wings told me they made the commitment, crossing the creek behind me. It was only a matter of seconds before they were at the decoys. Game over. They may have hung around and tried to beat up on my decoy, which would be fun to watch, but I didn't waste any time finding out. My first turkey was down and I'm a little proud that I made it happen hunting solo, calling them in and putting my tag on a bird! We joked about my turkey calling afterwards and I received a couple apologies. 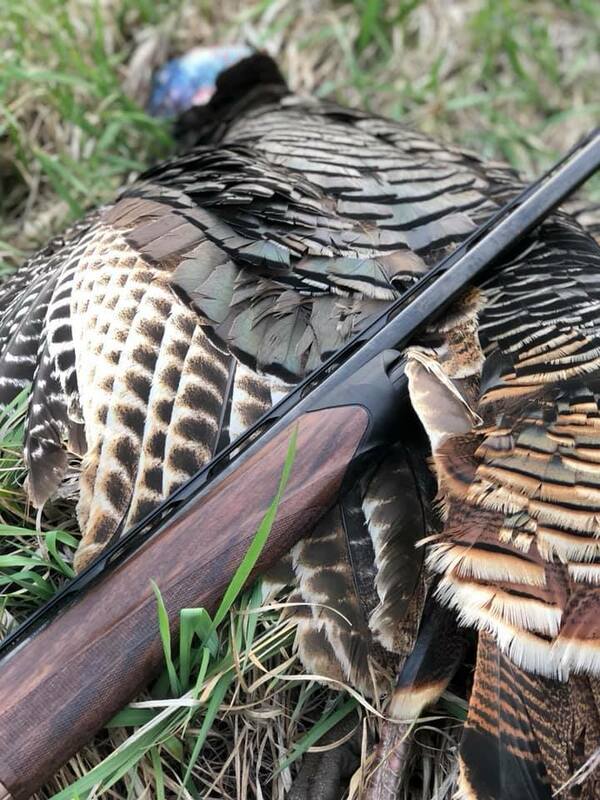 In all fairness, I surprised myself a little and will admit that I didn't practice calling like I should have and don't know how to use a mouth reed for turkey calling. That's okay... gives me something to strive for next time! I ended up with a second turkey this trip also! Two solo hunts.. one morning and one evening set and two tags punched (more on the second hunt later). WOW! That never happens for me. Don't mess around with this momma! 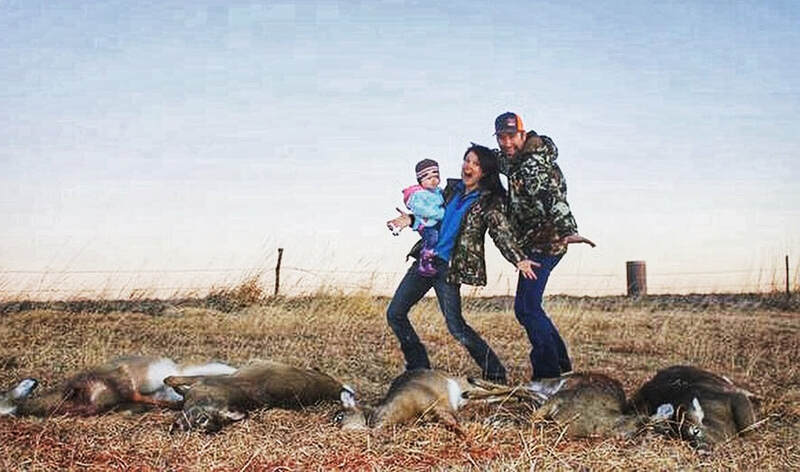 Have you introduced your kids to hunting? Are you not sure how or when to get your kids involved in hunting? We weren't sure either at first, but knew that we wanted to introduce our daughter, Lindsey Jo, at an early age and take her with us as soon as possible. Here are a few tips and what we've done so far with our now almost 2 year old baby girl. We aren't experts by any means, but thought it would be fun to share what has worked for us. It isn't always easy, but the extra effort is worth it! Leading up to our hunting trips, I made sure to talk to Lindsey about all the animals we would see and what we are going to do outside. 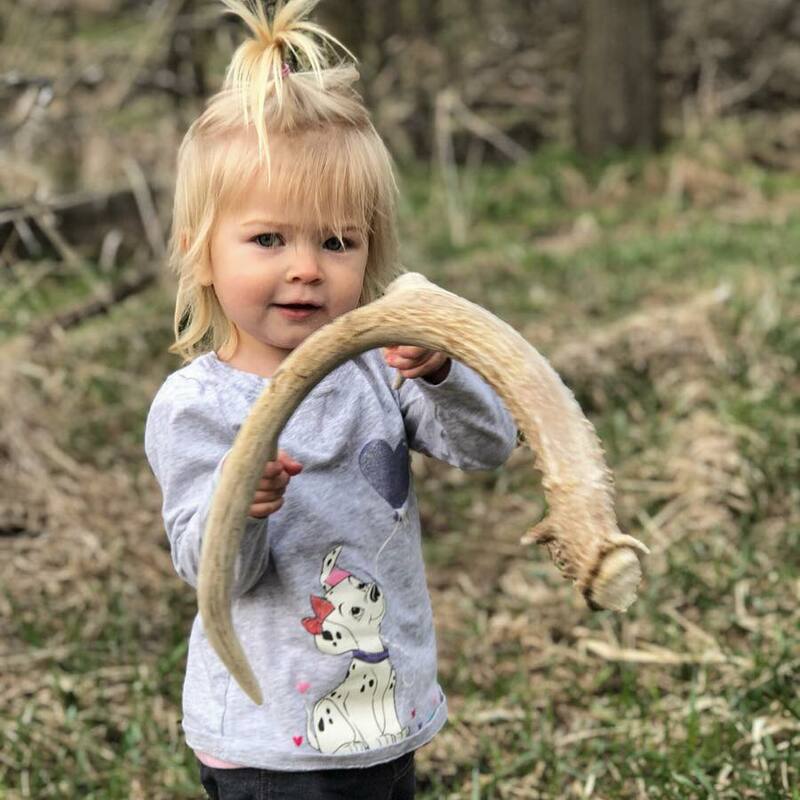 Granted, she was only 15 months old when we took our first big hunting trip, but I think it did really help to get her excited when I told her what we were about to do. Plus I let her help me clean and pack the camper. By the time we set up our home on the mountain, she was used to the camper and excited about living in it for a couple weeks. 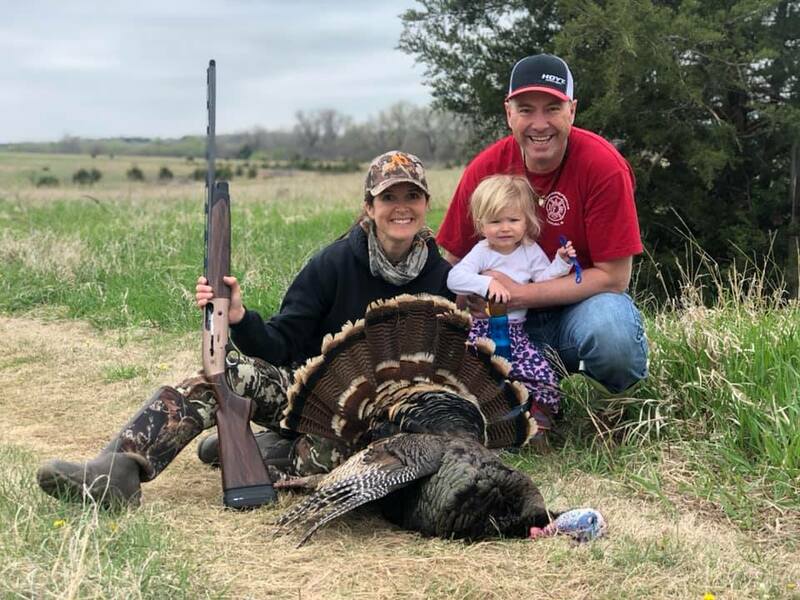 When we found out that we were pregnant almost 3 years ago, Troy and I knew that our hunting lifestyle was about to change, but we also knew that it didn't mean we would stop hunting. 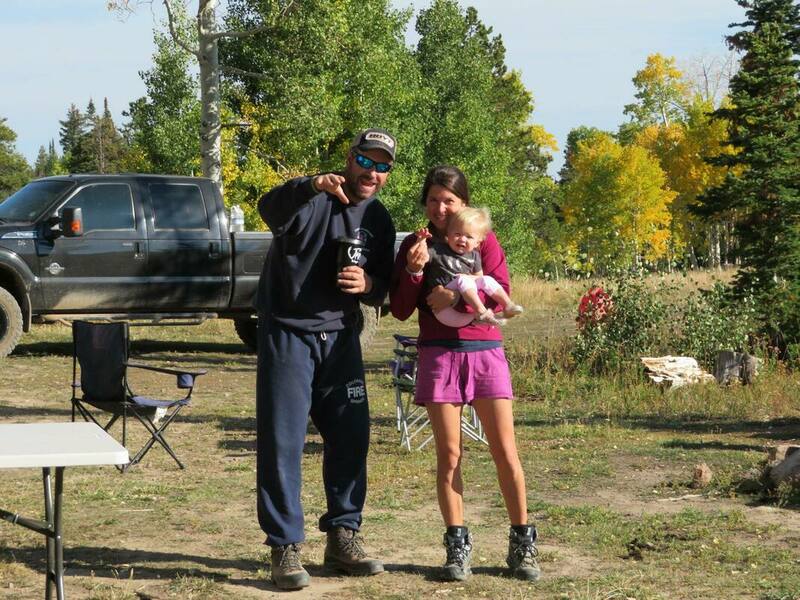 We spend the majority of September hunting elk in Colorado, so what was this going to look like now with a baby / toddler? "New" camper. We purchased a newer (used) camper that had a bunk room which would provide extra space for a pack-n-play and plenty of toys! We've since learned that we probably could have gotten by with a little smaller camper and are considering down-grading from the fifth-wheel we purchased last year. I may do a whole post on this, because we learned a lot over this last year regarding campers. More on that later! Take turns hunting or just hunt less. Troy and I used to hunt together all the time. We've now learned to do more solo hunting so that we can take turns watching Lindsey while the other person hunts. Honestly, this is more true during whitetail season. Elk hunting is a little more tricky to solo hunt for us. So, we learned to relax and not hunt ALL THE TIME while on the mountain. We took the time to enjoy being together as a family. This was a little hard for me to adjust to at first, because I'm used to going full force and taking advantage of every daylight hour while hunting. Trust me, when my mindset changed, I was able to truly enjoy sitting in camp, drinking a cup of coffee and watching my daughter pick flowers while my dog ran along beside her. There will be a time when she will want to come with us on an actual hunt, but for now, we will cherish these moments while she is little. Invite Grandparents. Having our parents up on the mountain allowed us to hunt together for several days and Lindsey got great quality time with her grandparents. It was a win-win! The bigger camper also allowed us to have room for grandparents. Whether you are just bringing kids to hunting camp or letting them actually go on a hunt with you, remember to keep it FUN! Young kiddos have short attention spans, so be prepared with fun activities to keep them occupied. 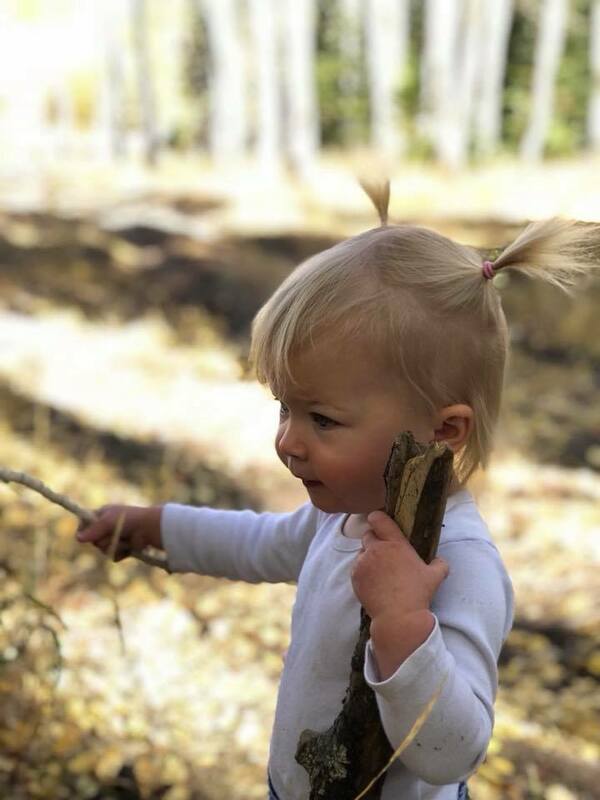 This may be simple things such as "washing" rocks, making daisy chains, catching grasshoppers, drawing in the dirt with a stick, etc., or just sit back, watch them explore the outdoors (within your vantage point) and let their imaginations soar! Lindsey and I took many walks around camp just exploring, which was one of my favorite memories from last September. If you are actually taking a young kiddo on a hunt, remember to adjust your expectations of the hunt to match your child's age. Asking a 2 year old to remain quiet for an hour, much less 5 minutes may be asking too much. WAY. TOO. MUCH. 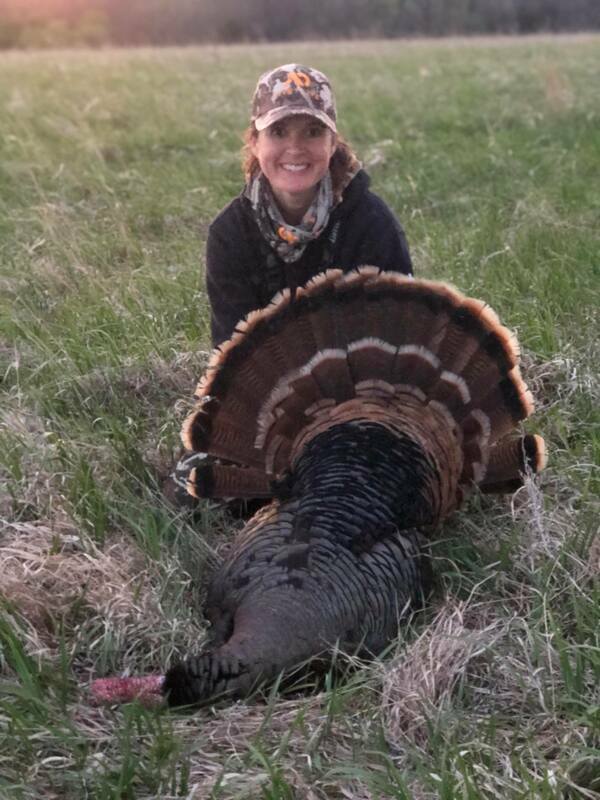 We are hoping to take Lindsey turkey hunting this Spring... we may not even see a turkey, much less shoot one, but we know that. It is all about the experience. I wasn't sure how Lindsey would react when the first deer was brought back to camp last fall, but I wasn't going to shield it from her. I want her to understand the whole process, within reason of course. So when everyone was gathered around the truck admiring a buck that someone in our group shot, you can guarantee that Lindsey was there also. ​She then became very curious about the deer hanging in the shed. I watched closely to see how she would react, since she didn't shy away from it, I allowed her to watch the skinning process. As appropriate, Troy and I will continue to explain the process so she understands where her meat comes from. At this young age, I don't think she needs to see the entire process from killing, gutting, skinning and preparing the meat. However, we will slowly introduce this to her, involving her in the process as she gets older and expresses interest. I am hopeful that she too will love and appreciate all that is involved with hunting. What about YOU? We want to know when and how you introduced your kids to hunting. Do you have any tips or advice to share? What has or hasn't worked for you? Here we go! I'm toeing what feels like the starting line of this blog again, and getting ready to document all our "From the Draw" moments! It's hard to believe that it has been over TWO years since I've really shared any of my hunting stories. A lot has happened and I'm finally getting the itch to write again. It feels good. 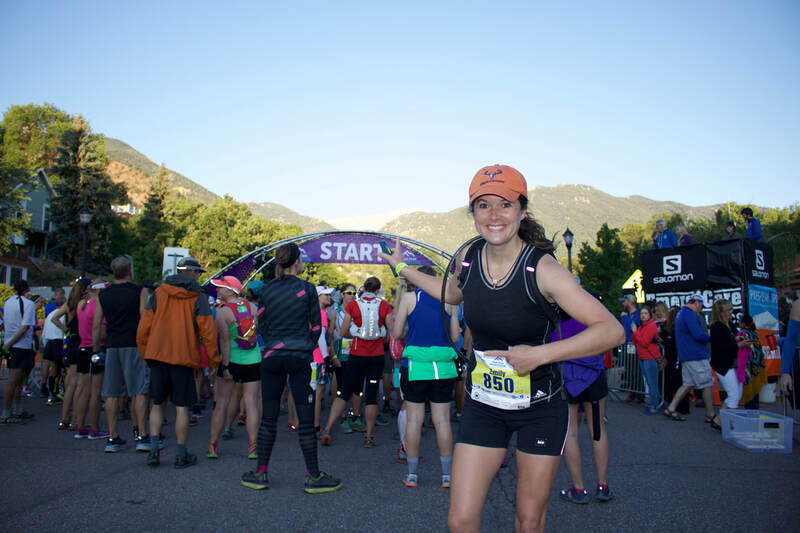 I ran Pikes Peak marathon while I was pregnant. I didn't know I was pregnant. After 17 years of wearing the title of infertile, I had no idea I was carrying my sweet little Lindsey Jo when I took on this challenging race. Everything turned out fine and I didn't actually find out I was pregnant until after helping to carry two elk off the mountain durning elk season. (More here - Eclipsed Hallelujahs ). After Lindsey was born, I took on being a full-time mom while working from home full-time. It was amazing and challenging at the same time. 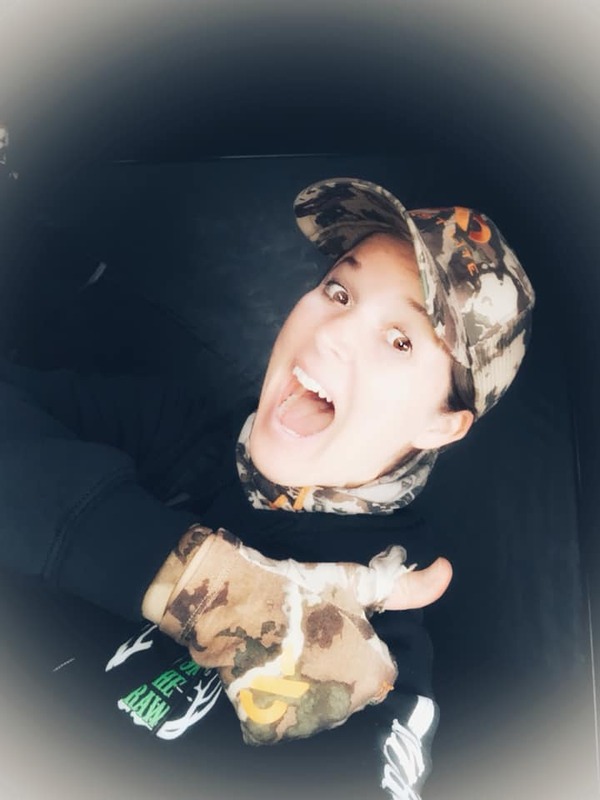 After a little over a year, Troy and I decided it was time for me to quit my social media job at the Outdoor Sportsman Group (Outdoor Channel, Sportsman Channel, etc.) and dedicate my time to the more fulfilling job of being a mom. Best decision I've made! This last year, I've had time to invest in my little gal and watch her learn to love the world around her. With Troy's job on the Colorado Springs Fire Dept, his hours allow us to take little trips and adventures during the week. It also allows us to spend more time hunting and exploring outside. That brings us to now... we are starting to bring Lindsey with us more and more as we continue our hunting adventures. She spent several weeks with us up on the mountain during elk season last year. This year we will be there a FULL month. We look forward to sharing our stories with you again. This time, as a party of 3! Jeff and his boys will be tagging along also and sharing their hunting stories. We are planning on bringing you once again all our stories, advice on how to hunt with kids, keep them active in the outdoors, etc. So if that interests you, please follow along! P.s., I've signed up for a couple races this year to help stay in shape for elk season (Hey, I'm getting old and need some motivation to keep me going.) I'll be writing a bit on that also. 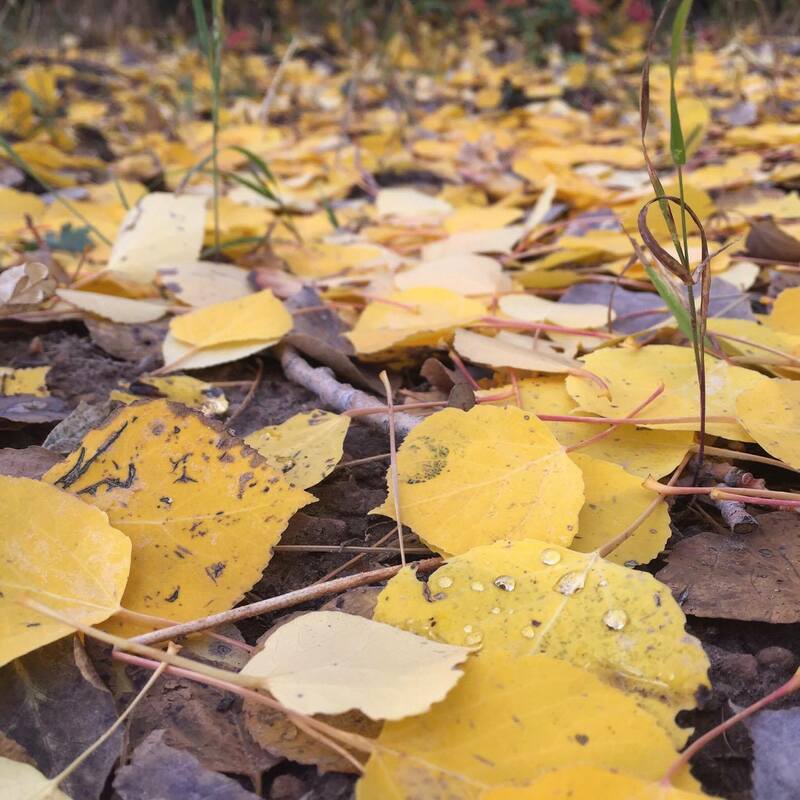 Fall of 2016 was fast approaching as the leaves were changing here in Colorado. 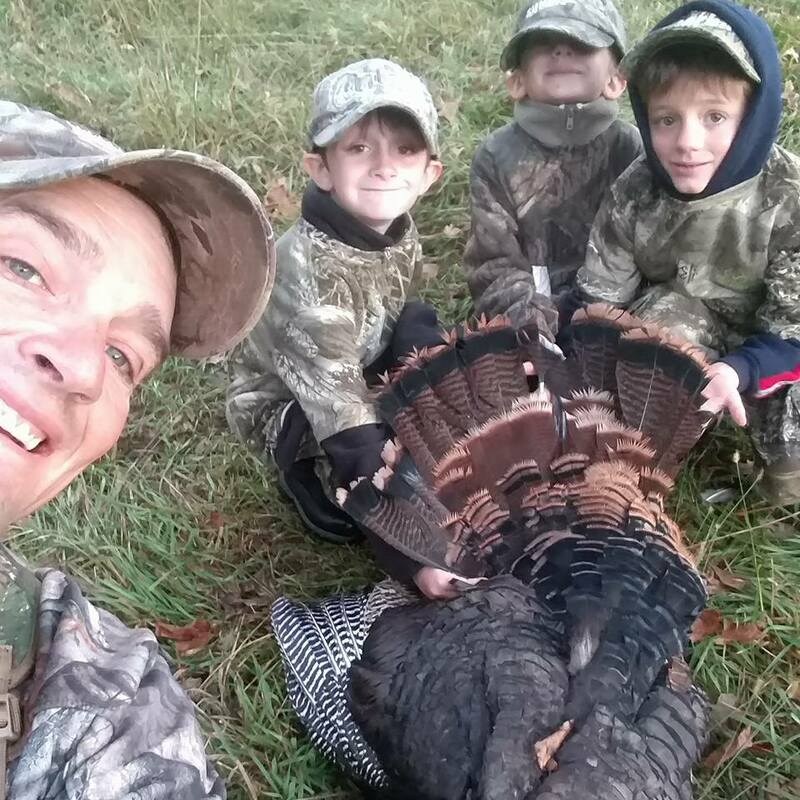 I was dreaming of a fall turkey hunt with all three of my young sons, Trent and Tristen (my five year old twins), and my youngest son Riley (now 4 year old). 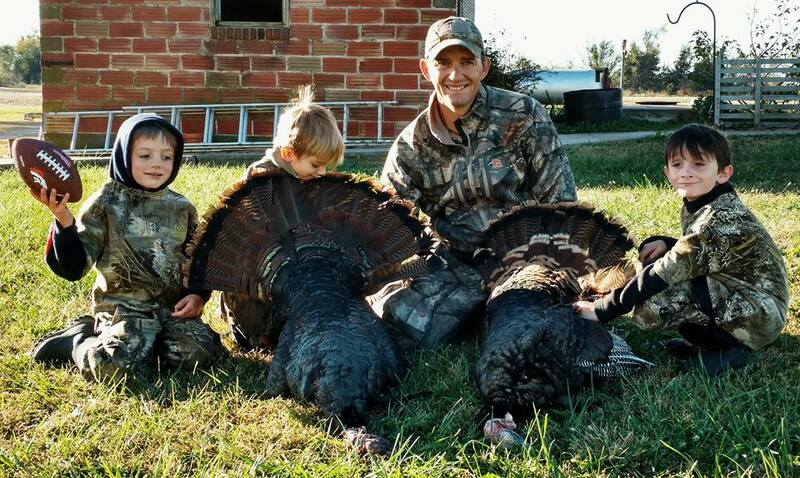 When the twins turned four I took each of them on their first turkey hunt. For Tristan, it was fall 2015 in Colorado, where the two of us put a great deal of time looking for a flock that I know winter in a valley. 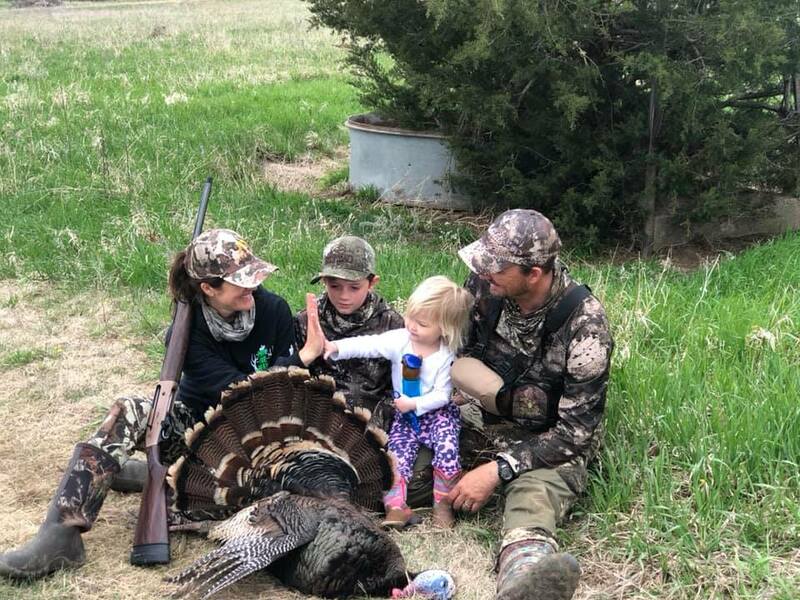 It took two weekends and we put down a respectable jenny, making Tristan's first time turkey hunt a success. 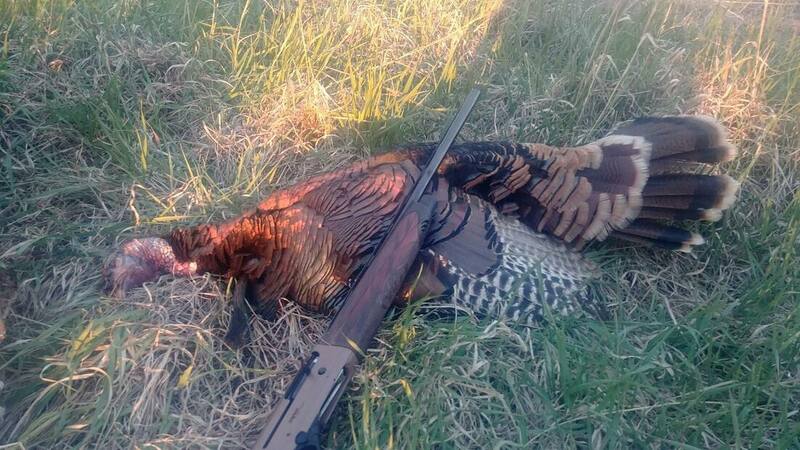 A month later found Trent and dad in Kansas fall turkey hunting. With great success, my tag was filled the first evening with a Jake. 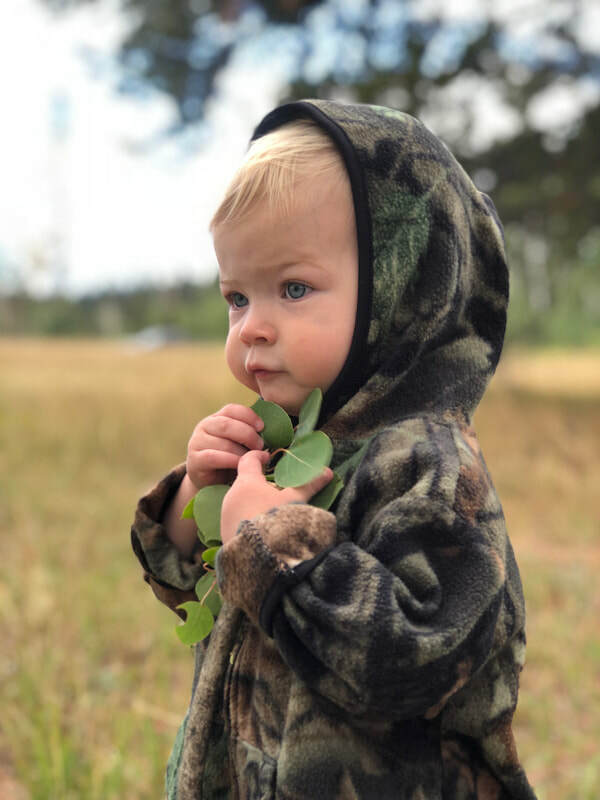 We arrived around 4:00 pm at the farm and quickly unpacked the van, said hello to my wife's uncle, then got all the camo ready for the boys to quickly put on so we could pull off an evening hunt. Getting three young boys ready who are full of excitement is quite a challenge all by itself. After breaking up fights, several times telling them to hurry, and figuring out whose boots were whose, we were driving North to Steve and Cindy's farm where I have killed several nice turkeys over the years. The boys and I headed to the north pasture, where I knew there is a roost tree for the Rio Grande we were hunting that evening. This pasture has trees to the south, west to the north, with a creek to the west, forming a horse shoe of trees and a cow pasture in the middle. It's perfect to see turkey coming from the corn field to the East for a night of resting in a familiar tree, except this time the Petersen tribe would be waiting in a ground blind for them to arrive. Trying to keep all three boys quiet was no small feat. Fruit snack packaging rumbled as the boys tried to open them, then a conversation would spark up and I would have to remind them to be quiet. As the sun began falling quickly to the West, I knew we should be seeing turkey soon coming to roost. Anticipation ate at me, as I scan the field looking for any movement. It was now 5:50 -- much to my surprise NOTHING!!! What? Then I begin to second guess myself. Did they hear the wrappers? The boys talking? Or dad saying "SHHHHH!" loudly for the 300th time spook them off? Just as I was thinking this to myself I heard a loud and very distinctive sound behind the blind. Every turkey hunter knows the sound of a bird flying off the limb in the early morning that compares to it. Well another sound of a bird flying in the tree.. are you kidding me!! The turkey have back doored the tribe. I tell the boys to sit still and be quiet as the turkey are behind us and are flying in the roost tree. I sneak out of the ground blind and start looking up in the cotton woods for those sneaky turkeys. I know they are very close and take my time hoping I can see a couple on the ground. I tell myself, take your time they are in here. Then BUSTED! I spooked two toms off the limb, and watch them fly south down the creek into another tree. All hell breaks loose as the two gobblers take flight, the sounds of turkey cables and clucks in front of me across the creek. A group of gobblers take off running up the creek bank, I raise up my 12 gauge shotgun and single out a red head about 30 yards away. 5:57 BANG echoes on the farm as the gobbler drops and starts the death flop down the creek bank. I watch eleven more gobblers run, now sky lighted on the horizon, as I debate filling my second tag. I choose not to take the second shot because my first turkey is looking like Michael Phelps in the creek below. Soon the water head turkey expires. Great! He's right in the middle of a 20 foot across creek, possibly deep creek! I run up to the blind to grab the boys. The boys are now out of the blind and meet me. "Dad, did you get one?" I chuckle and tell them, "YES I did, let's go see him boys." We walk to the creek edge and I tell the boys, "you see that black spot in the middle of the creek?" That is our turkey, boys!" They turn and look at me with a look on each of their faces that I will always remember. I know the question that is coming next. Soon Trent asks, "well, daddy, how are we going to get our turkey?" As I look around for a long tree branch, the retrieval plan is hatched. "Well boys, let's get a long branch and we will pull him out of the creek." The boys help me carry the long branch to the creek's edge. We look down the creek bank and it's 8-to-9 feet straight down. The 9 foot branch is no good at this point. I know what I must do, but dread the thought of it. I take a deep breath and start stripping clothes off. The boys turn and in a mortified voice ask, 'Dad! What are you doing?" ​"Well, boys, I have to go swimming for our turkey." At this point, the snickers and laughing begin as I strip to my skivvies. I ask my oldest Trent to hold my phone as I figure a way down the steep creek bank. As I survey my surroundings, I realize there is no easy way down. "Daddy, I have never seen you swim before," I hear as I kneel to grab the tree root. "Boys, your dad is a great swimmer!" I respond, as I consider the murky water below, thinking ... "I hope it's not THAT deep." I grab the root and slowly move my bare feet to hold my weight; as soon as my feet have weight on them they shoot down the Kansas slick muddy creek bank up to my knees. As I gather myself and stand up, I think to myself, "thank God it's not too deep." As I hear more laughter on the bank above me, I proceed slowly to retrieve my turkey. With evert step, I feel the mud smooth between my toes and I try not to remember the catfish, turtles and crawdads that inhabit this lovely cold creek. As I slowly creep toward my water head turkey, and feel for a drop off with my feet as the water is getting deeper, anticipating at any moment a swim in this murky water. I see flashes coming from the now dimly lit sky, Trent is taking pictures with my cell phone and announcing, "I'm taking pictures, Dad!" I chuckle as I take another step. The water is now mid-thigh as I am 5 feet from my turkey. As I progress slowly with my arms above my head, goose bumps the size of marbles appear, mud squishes between my toes and sky quickly loosing light with the sun setting, I think, "Well here is a lesson for the boys!" Another couple of steps and I should be able to reach my turkey. The water is now hitting a place man doesn't want cold water to hit - EVER! I now reach for my turkey while gasping for air and grab a wing. I pull what felt like a 40 pound turkey to me! I work my way to the bank while the paparazzi's flash continues. I now try to climb my way up the steep bank with the water-logged turkey in hand, slipping and sliding several times. I finally get a hand on the tree root I used to get me so elegantly down and pull myself up the bank. The boys are waiting for me at the top and help with our turkey. Trent wants to take a picture of me and my turkey. I oblige him at this point because all I want to do is get warm clothes on. We take a few selfies of me, the boys and head to the van. On the way to the van, I tell my sons "boys, remember this hunt. If you are going to shoot and kill an animal, be prepared to go after it no matter what it takes. This will be a memory you will always remember." They laugh and say, "that's right Dad,! Even if you have to go swimming." Then we talked about what we were going to call this turkey. Some of the suggestions were water head, turkey creek swimmer. Then I said, "how about we call him skinny dipper?" After explaining what that meant, Skinny Dipper was his name. When we get to the house the boys and I retell the story to my wife and her uncle. Of course there is even more laughter involved. Later that night lying in bed I look at the pictures Trent took with my cell phone, my wife and I started to laugh harder than before. Trent captured me wading out to get my turkey. But the best picture was before I got my clothes on - a pose with me behind the tail feathers fanned out, looking completely naked! 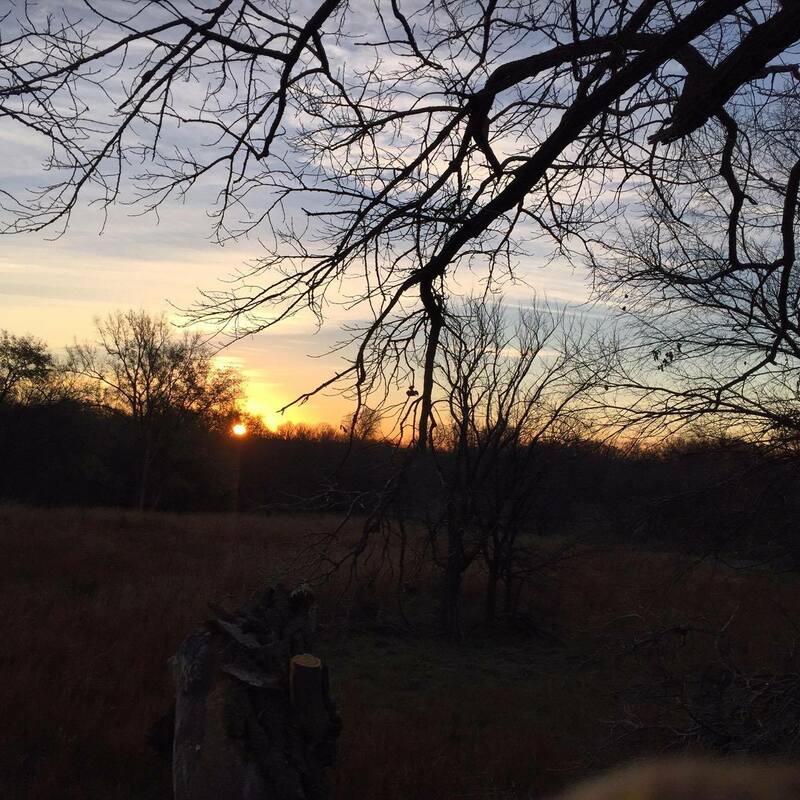 ​The next morning, we all got up before dawn to try and fill my second Kansas tag. We saw turkey fly south so we headed west out of the south pasture to see if we could get a good spot and maybe get a shot off. As we were walking, we heard a gobble to our left. We are now walking right in the middle of this pasture where there is nothing to hide behind. We all stop in our tracks. Trent loudly whispers, "Dad, did you hear that?" I reply, "I sure did! Quick get to those trees" as I point to the tree line. We duck for cover and sit at the first trees we come to. As the woods start waking up for the day, we hear hens soft cluck behind us. "Daddy, do you hear that?" asks Trent. "Yes, I do bud, that is why daddy tells you to keep quiet and listen." Then a gobbler clucks in front of us down the tree line. We are in the right spot to fill our 2nd tag! We sit and listen to the turkey wake up and talk to each other for a minute, before I put in my mouth call and start gobble yelping and clucking. With each cluck I make, I get a response. I lift my gun into position, do a fly down cackle and wait. I tell the boys to watch out in front of us. Soon after that, two toms come soaring down and land 45 yards away from us. A small voice asks, "Did you see that?" I whisper "Yes - okay boys watch that turkey!" At 6:41 am a BANG fills the morning air and the tom starts the death flop. I announce, "Okay boys let's go see our second turkey" and the boys run to the flopping tom with me in tow, while the tree to the left EXPLODES with turkey. As each one flies from the limb, I can see their silhouettes again in the morning light and start counting 1, 2, 3, 4... 12 gobblers total make an escape to safety. In the end, we filled two fall turkey tags in under 12 hours it was a pleasure to share these experiences with my young sons. Some very important lessons were learned this fall that I am sure they will never forget. As for me, I might have to add chest waders to my turkey vest, or a fishing pole! Skinny Dipper is now mounted right above the front door of our house. I am sure for years to come it will bring many more laughs and always be a lesson for my sons as they continue to grow a passion for hunting. 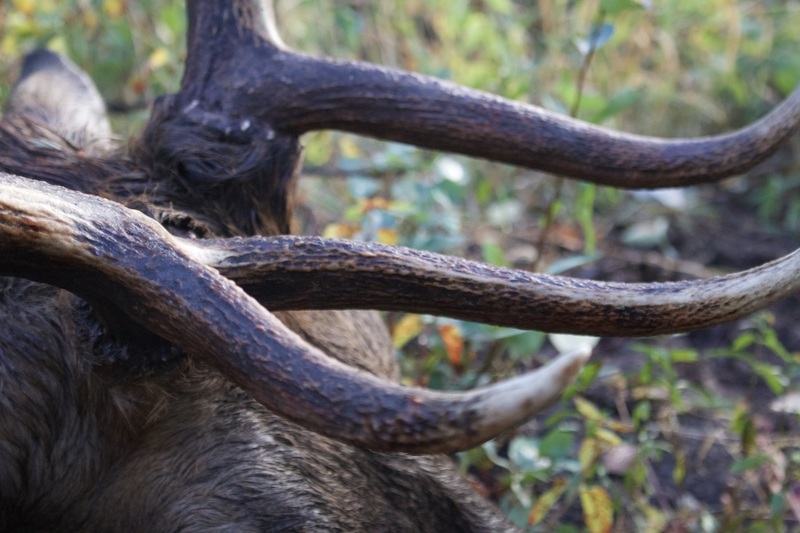 Bugles are still a rare commodity this elk season. If they could be bought, we'd be first in line. The bulls remain ghosts in the pines, shadows slipping just out of reach, leaving only footprints, scarred trees and other clues indicating their existence. We are ready to play the vocalization game, but apparently they are not. Tonight, with storm clouds rolling across the Colorado sky, hopes are high that it would be the trigger for a bull to give away his location. Troy, Todd and myself are loaded up in TED, our hunting jeep, aptly named for the animals we love to chase ... Turkey, Elk, Deer. Heads bobble as TED navigates over boulders on a road marked with a sign warning "travel at your own risk." Afternoon cotton candy clouds have quickly clustered together and now look more ominous than their previously carefree appearance. TED reaches a curve in the road with one of the largest pines around prominently marking the entrance to the beginning of tonight's hunt. We make quick work in grabbing our bows, securing rain gear and loading packs. Saturated ground silences our movement down the mountain slope. First Lite Gators guard against rain-soaked vegitation threatening to soak through camoflauge pants. As we venture down in silence, rain softly falls around us. Thunder rolls and a lightening bolt streaks across the western sky. The intensity of the flashes of lightening stops us in our tracks. As we hunker down, the next series of thunder and lightening makes quick work of trying to compete with the last round. Our eyes meet. Without saying a word, the three of us could read each other's thoughts. It's probably best to NOT find the largest tree to stay dry and wait out the storm this time -- our footsteps are reversed and we make our way right back to TED, just as the another lightening series gives way! None of us want to add to the statistic making Colorado one of the top lightening death states. There's usually a junction during each hunt with a critical decision point; however, the importance of the choice rarely is revealed until future reflection. It's unrecognizable at the time. While sitting under the cover of TED, several discussions were held... Stay and wait out the storm? Call it a night? The allure of a campfire, food and a nightcap was strong. The sky taunted us as small rays of sun pierced through storm clouds in the distance. 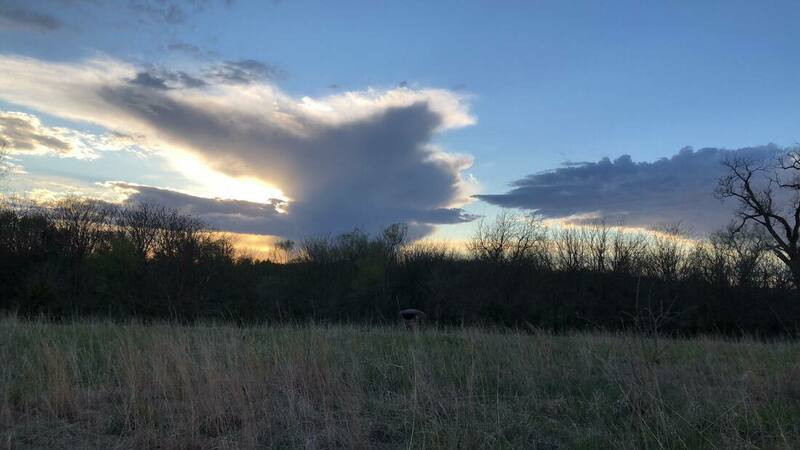 Will the storm clear in time for a quick hunt before sundown? Finally, the rain lessened and the flashes of light slowly moved on to distant targets. It was go time and we were glad the decision to wait it out was made! Stealthily we worked our way down the now soaked mountain. The lingering storm clouds decided to wring out their remaining weight, as if reluctantly ending the storm's furry. The smells of the earth, pine and mountain vegetation tickled our senses as we once again found thick pine branches to hide underneath, while the last heavy downfall of rain washed down around us. Each of us now 10 feet apart under our own pine tree, cow calling periodically, listening and watching for signs of elk. As I looked up at Troy, he was holding his bow at the ready, looking to the left. I eyed Todd in the pine tree behind me. He too was motionless, looking up past Troy. He mouthed the words I already knew ... "elk!" We all were now poised and ready for the bull silently headed our way. Looking back up at Troy, I caught movement. A bull was now 10 yards above him on the other side of thick cover. There was a small opening and as the bull took a step, I watched Troy release an arrow. The sound was unmistakable. His arrow found its mark and the bull ran downhill right past Todd and I. Mentally marking his location, I glanced back at Troy who was now motioning to us that he had killed his bull. I mouthed the words, "I know! I saw it all!" As we made our way to each other, he quickly said, "Oh he is DEAD!" Again, I told him, "I know ... I saw him fall and heard his last breath! He is right over there!" Part of the thrill of the hunt is experiencing it with someone. 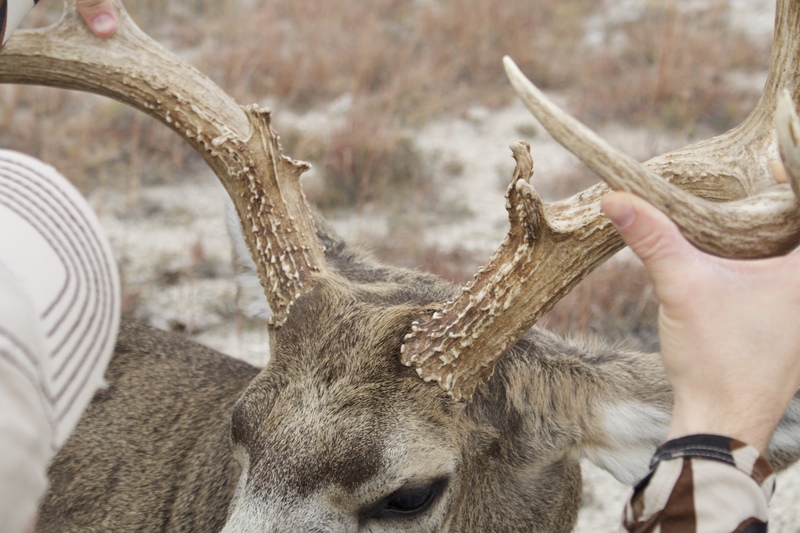 Sharing the excitement of a successful hunt, in a way puts an exclamation point on it all. The joy in the moment is greater when among friends, and a bonus... the work of hauling the elk off the mountain is lessened! A big thanks to Mark and Darwin for their help in packing out Troy's elk. We love our elk hunting "neighbors" and appreciate this friendship made on the mountain. We look forward to next time we are in the same elk camp! This year started out with a bang! 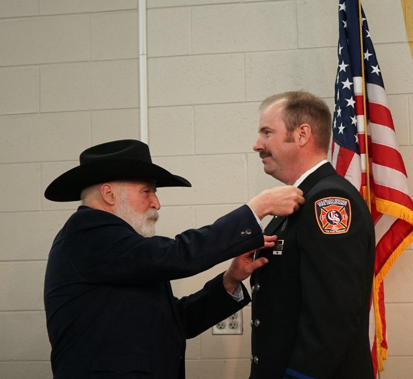 On January 19, 2016 I was promoted to Driver Engineer for the fire department I have worked for 12 years. With my wife on the road, work duties at Shot Show 2016, I was blessed to have my father-in-law pin my driver badge on for me. It's a tradition where the individual being promoted has a family member pins the new badge that they are promoting to on their chest. I was honored to have Jon to the pinning for me since Emily wasn't able to be there. 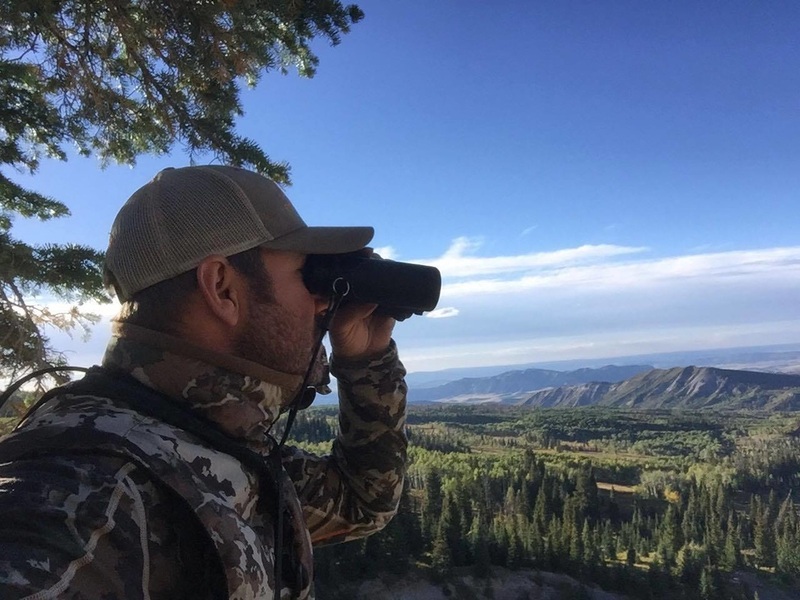 ​With the promotion behind me, my thoughts started to set in on the hunting season ahead. Emily and I had drawn our elk and deer tags for the unit we have been hunting for the past 12 years. With that said, there were a couple of times we didn’t draw and had to go "over the counter" in another unit. So we were excited to get back into the area we know and love to be in, because we have become good friends with most of the folks that we have met up on the mountain over the years. This year was no different. Jeff, a friend I had met and helped get an elk, was coming back to Colorado from Illinois for his elk hunt. Along with Jeff, two other gentleman we know, Mark and Darwin, will be there also. They would be in camp for thirty days and Jeff would come the last two weeks with another guy that’s new to camp. We texted most of the summer once we had drawn our tags. With opening day only a couple weeks away, I had been trying to get the camper packed up and all my gear and Emily’s gear situated. Suddenly, one morning at work I woke up and my right elbow started to hurt. In fact, it hurt so bad that I was unable to pick up a cup of coffee with my right hand! I felt a sinking feeling in the pit of my stomach. I was unsure if with pain I felt in my right elbow if I could even draw back my new 70lb Hoyt Carbon Defiant 34. Immediately I called another guy on the department that had the exact problem but he couldn’t even hold on to a pen to write his name. This guy is a pro shooter and also owns the archery pro shop in town. After speaking to him, he told me more then likely I had a case of bursitis in my elbow. He also stated that he just finished electrotherapy on his and it’s back to 100% but it took over six months of therapy. I was in disbelief that this was happening. It was like I was on the ground because someone just kicked me in the stomach and took all the wind out of me. I set up camp that day and took two ibuprofen before climing into bed and calling it a night. The next morning I woke up and it felt like someone had drilled a 3” deck screw right into my elbow. It was pain like I had never felt before. I got up, put ice on my elbow, took two more ibuprofen and made a cup of coffee. After stretching my elbow out and working it a little bit, it started to loosen up and felt better. Grabbing my pack and optics, I headed for a hillside known for having elk on it. Arriving at my destination late in the afternoon there was absolutely NO SIGN of elk in the area. This is completely crazy! I have never seen it like this before. I have seen the elk population declining in the area for the past 5 – 7 years but not to see a elk at all is hard to swallow. I know this area like the mountains around the town I grew up in, in Wyoming . Never have I been up here in this area and not so much as seen a cow before opening day. Going back to camp in the dark I was feeling a little out of sorts. What was the deal this year with me? First it’s the elbow and now no sign of elk in the area I have come to know so well. We followed them around the tree at the back of their camp and hanging in the tree were not one, but two elk racks! One 4x4 and one 5x5 hanging there. They had both tagged out within the first 20 minutes of opening day. I stood there in awe of these guys. I was so happy for them, especially since they had filled their tags that cost them so much money to put in for every year. 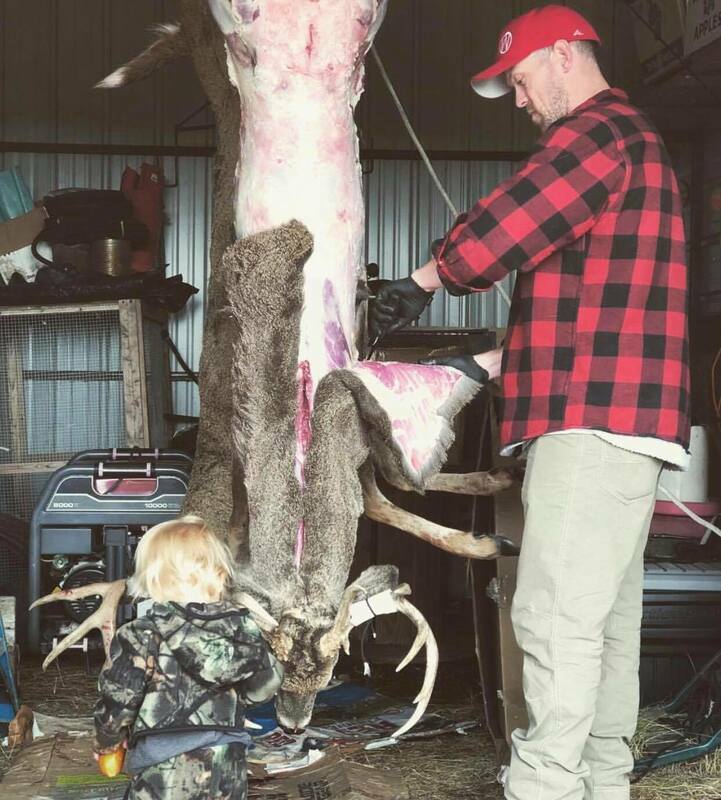 It's always nice to see friends fill their freezer and go home with good healthy meat to feed their families. While talking to them, they told us the locations of where they had harvested their bulls and we knew the exact areas. 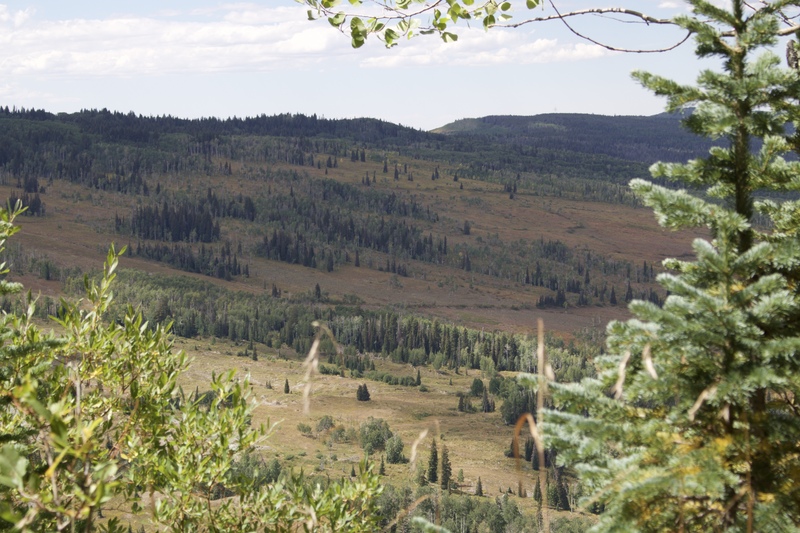 We had never seen any elk in that area, but had seen some good mule deer in there. Elk are a crazy animal to chase because you never can tell where they will be and how they will be acting at that point in time. That was only the first day. The season was about to heat up for us! Part II of this story is up next.